Amber Lynn began her martial arts career about 16 years ago with training in Karate, Kenpo, and Jujitsu. Within 4 years, she earned her first-degree black belt (Nidan). Two years after that, Amber earned her second-degree black belt (Shodan). While practicing these martial arts, she became interested in Muay Thai boxing. As a result, Amber joined Burke’s Martial Arts and began practicing Muay Thai boxing. She instantly fell in love with it and continues practicing it today. She also practices Vee-Arnis Jujitsu (street self-defense) and is on her way to earning a black belt in December 2017. Amber Lynn has been a kickboxing instructor at Burke’s Martial Arts for about 7 years. She’s passionate about helping others live a healthy lifestyle through proper nutrition and exercise. Amber also happens to be a certified elementary education teacher with a certificate in special education. Amber enjoys teaching children about making healthier food choices. In addition to martial arts, she’s a fan of weight training and the results of putting in the hard work. Once or twice a year, she enters fitness competitions just to “step out” of her comfort zone – she has to trade in her boxing gloves for high-heel shoes and a bikini. For Amber Lynn, martial arts has turned out to be a lifestyle. Burke’s Martial Arts has become her second home. 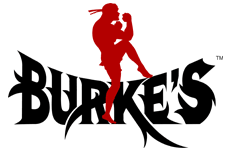 Amber Lynn is thrilled to be a part Burke’s Martial Arts amazing team!